Today's the day! 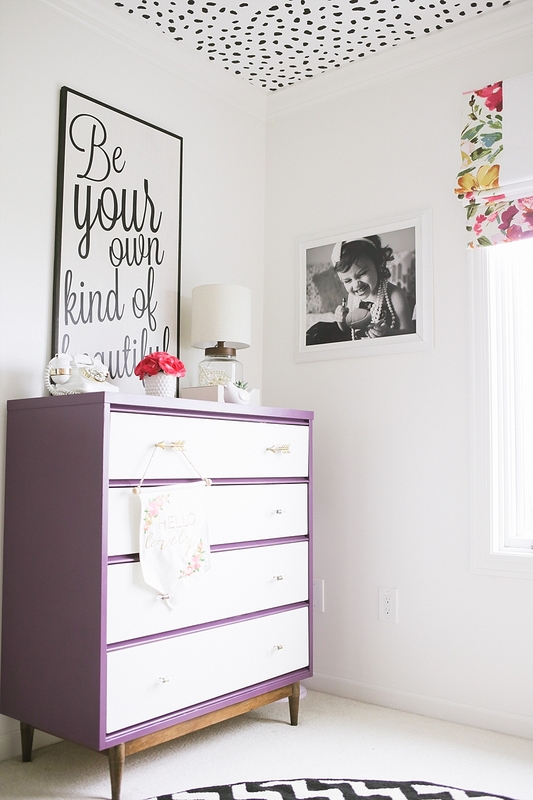 The final reveal on our little girls room! I can't believe how fast six weeks has flown by. This is only my second One Room Challenge. Last fall, I tackled a hallway, stair case, and multipurpose room that was only framed in. ALL WITHIN A SIX WEEK TIME FRAME! I will NEVER EVER do that again. This time around, I wanted something that was realistic time-wise. 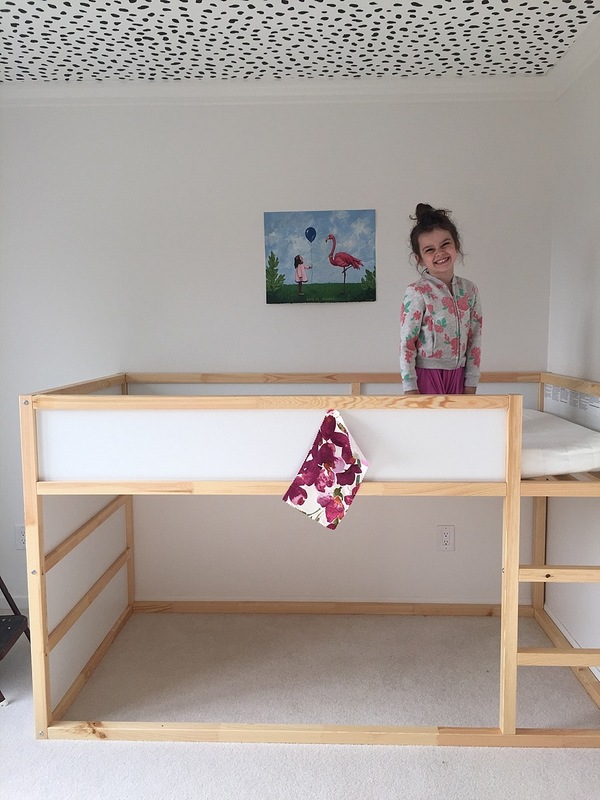 I chose my little five year old's room mainly because her bed was broken and we needed to replace it. It was the perfect time to give her a fresh space! A vision was born, and I got to work putting a plan in place. I made some changes to the original board mostly due to budget, or time constraints. I always like to reuse things if I can make them work in a room. Royal Design Studio Stencil's agreed to send me a stencil of my choice. 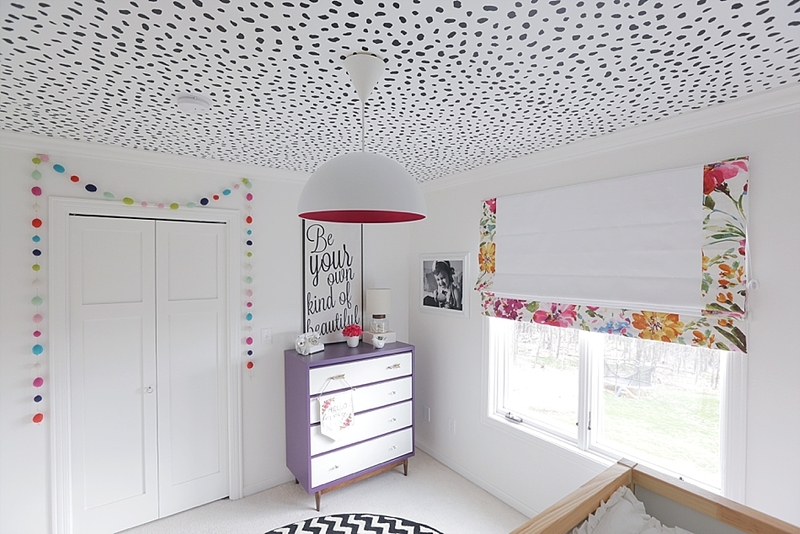 I chose this cheetah stencil for a modern, and yet whimsical touch to her space. 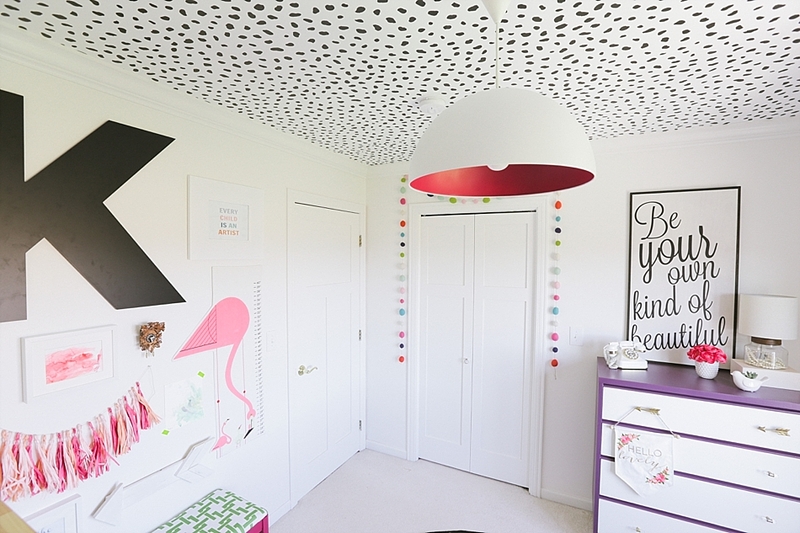 I will be posting more details on how I stenciled her ceiling in a separate posting, but for now, enjoy the pictures! Thank you again to Calling it Home, and House Beautiful for hosting such a fun event. 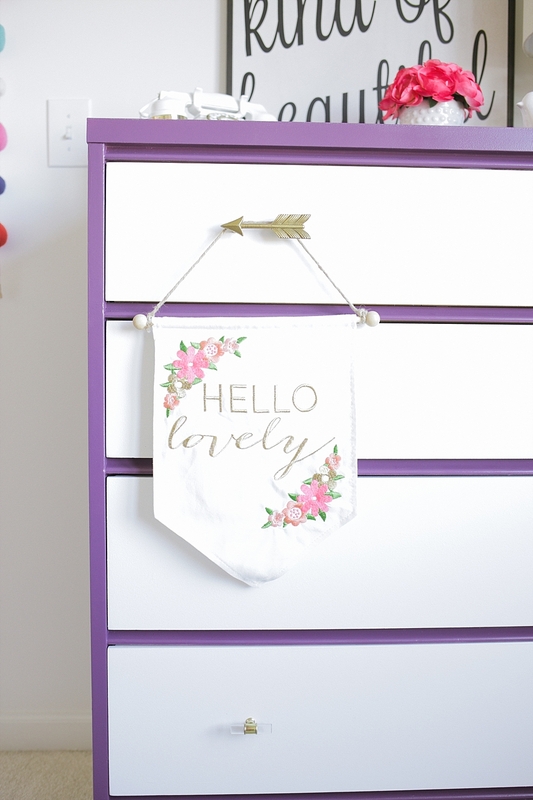 It really is a fun way to connect with other creatives, while creating a colorful space for our little girl. I was beyond blessed to work with such amazing sponsors. Thank you to Tonic Living, Beddy's, and Royal Design Studio Stencils for providing such amazing elements to her space, and believing in my creative ability!! As always, I am thankful for support from my readers. Your comments and sweet words are keep me feeling inspired, and for that I am grateful! Go check out all the other reveals over at Calling it Home. My fellow creatives worked so hard on their spaces, and there are some very fun spaces over there! This room looks like a dream come true. Your daughter looks so cozy and happy playing and reading in it. 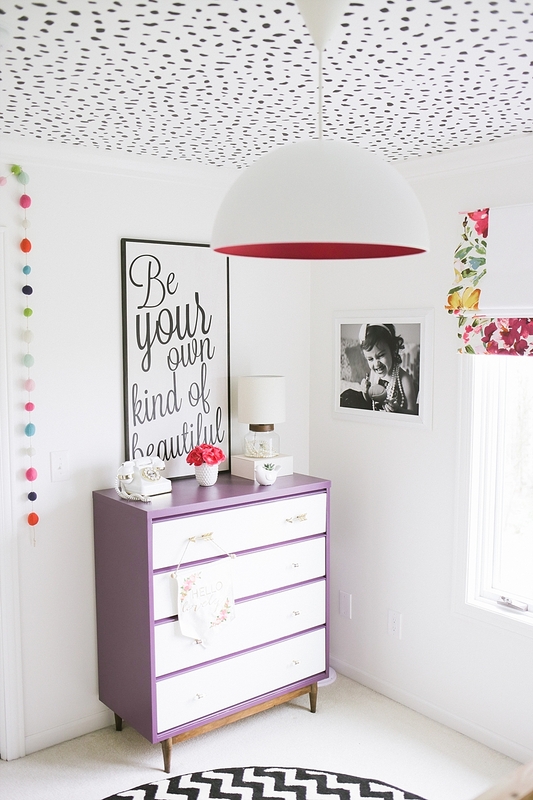 My favorites are that dresser, the lamp, the bed hack and the ceiling! So, so beautiful. Congratulations!!!!!!!! One of my favorites so far. Thank you SO much Mila for your sweet comments!!!! I really appreciate your support!!! Please let me know what you ysed to hang the curtins around the bed? Oh my goodness, this is such a great room! 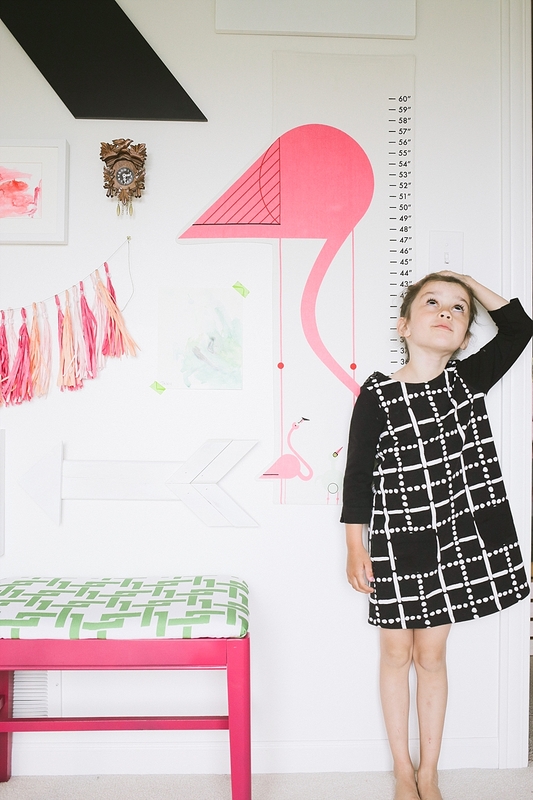 Your daughter measuring herself on the flamingo growth chart is too cute! You paid such attention to detail on this room and not only made it beautiful but also full of really smart functions. 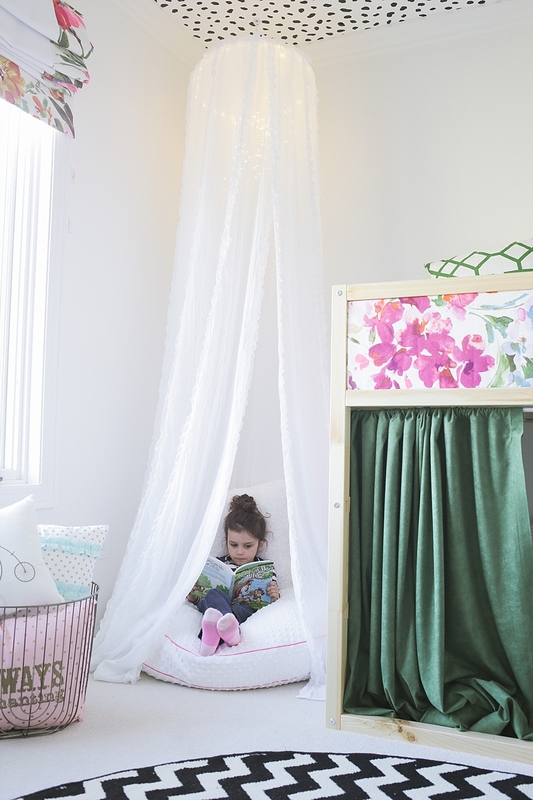 The reading nook in the corner, the book holders under the bed- you thought out each space! Well, well done! Thank you Erin! She's already made herself at home in the reading area. It is getting good use! I am SO excited to see what you've done. Can't wait until tomorrow!!! Thanks for stopping by, and for your sweet comments! 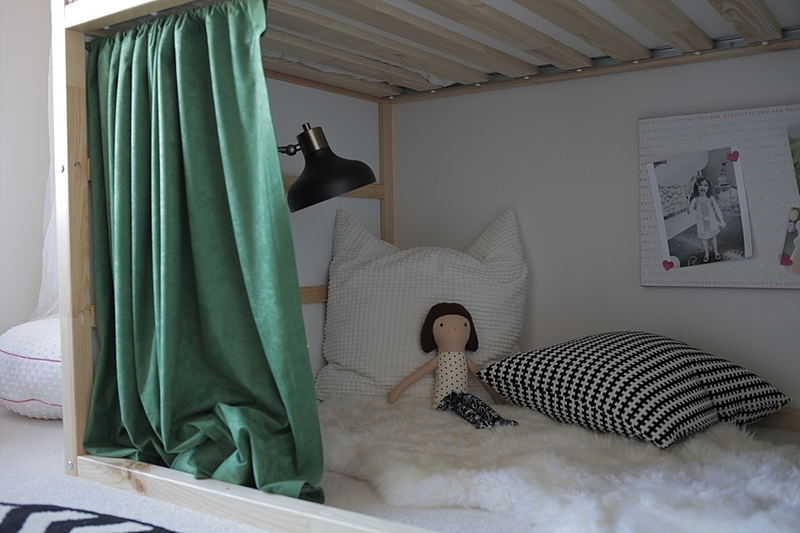 I loove what you did with the Ikea bed! What a transformation. That fabric is beautiful. 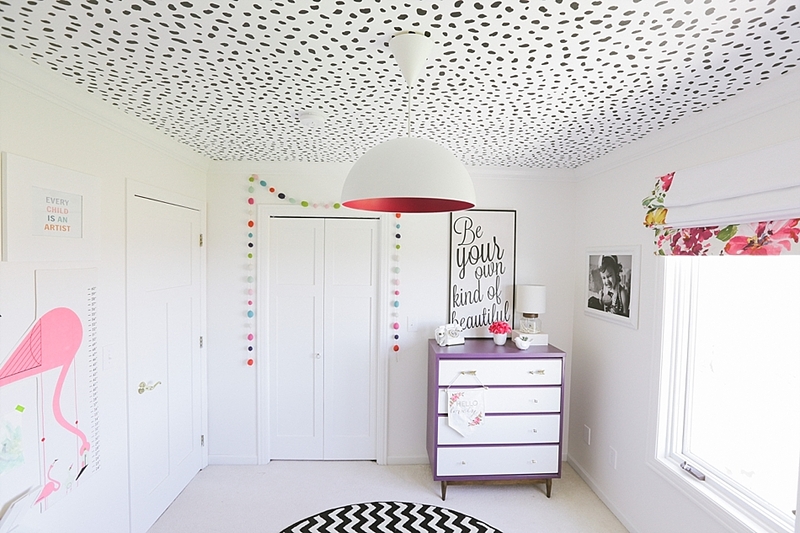 And I love the ceiling stencil treatement and all the fun colors in the room. Nice work!! Thank you so much! It was just begging to be dressed up, and it was so easy to add some extra color to! So cute!! And what a lucky, lucky girl!! 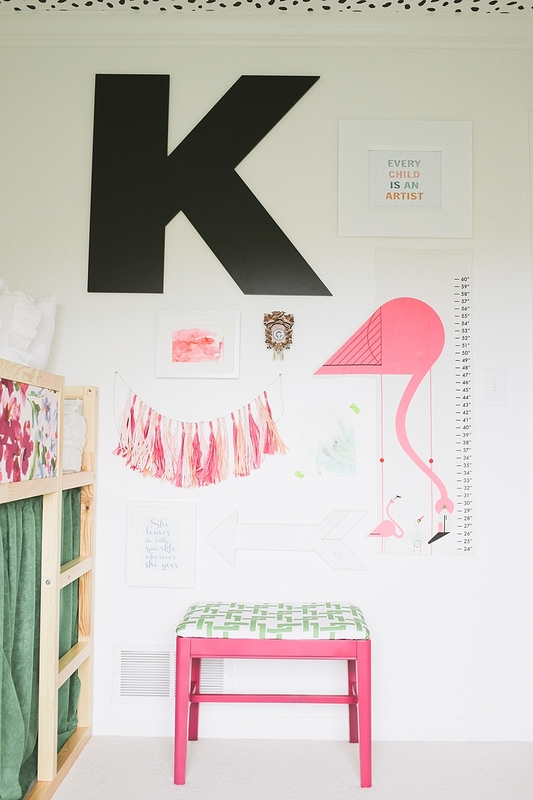 I love how fun and creative this space is! Oh my goodness, I just want to invite myself over for a playdate!!!! I love all the color and that ceiling is fabulous. Your little girl is too adorable. I love seeing everyone's children enjoying their new rooms. What fun! Thank you Tiffany for your sweet words <3! 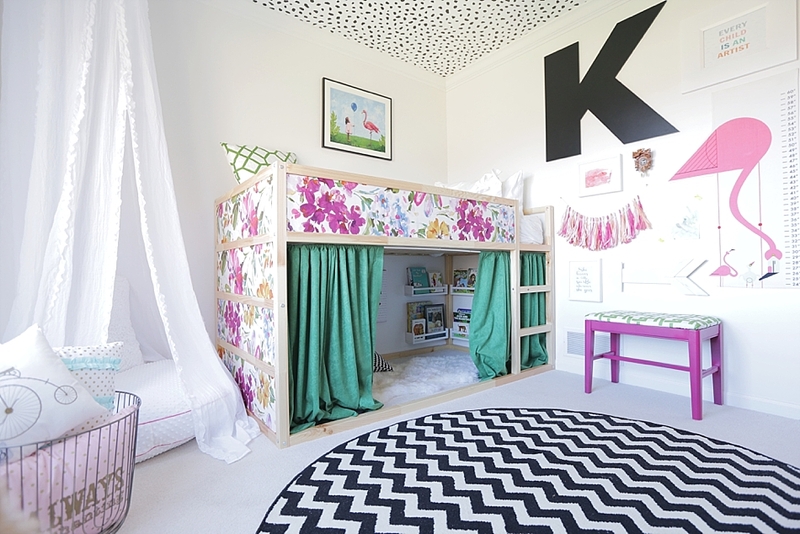 Not one, but TWO reading nooks? That alone makes this my dream bedroom. I'm so happy to have found your blog through the ORC, I will definitely be reading from now on! Thanks Molly!!!!! I love finding new people through here! Ha! Thank you! It was literally a pain in the neck, but so worth it! Stephanie, you are so creative and talented. 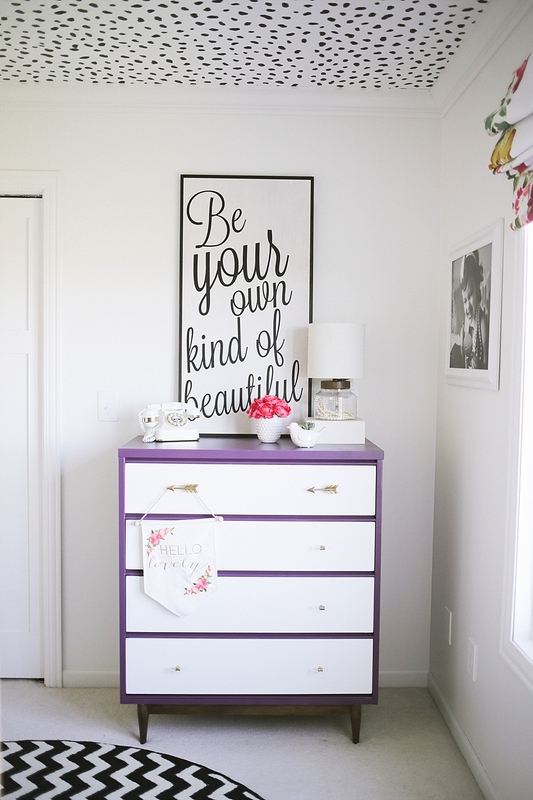 I couldn't love your sweet little girl's room more! 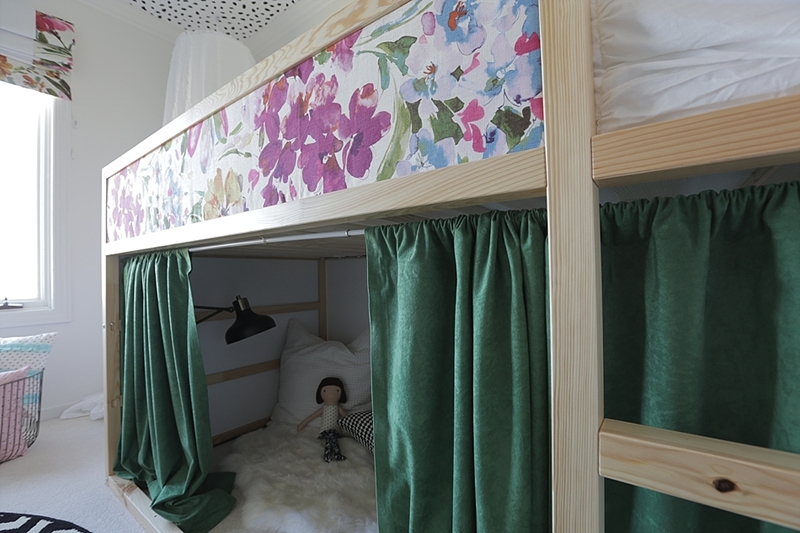 The ceiling, fabric panels on the bed, light, art.....all so good. My favorite picture is of your little darling reading her book, she is the cutest and what a special place to call her own! 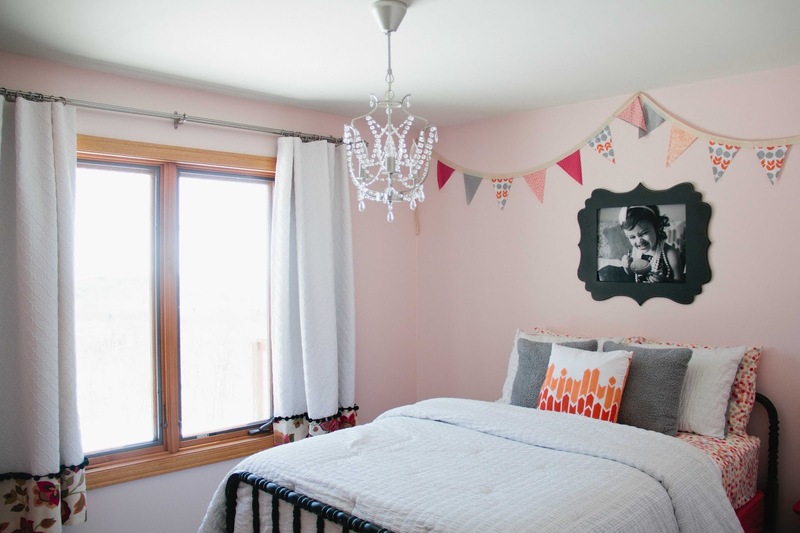 this is amazing, stephanie- such a dream room! the colors and patterns are gorgeous and your photos are awesome! This room is darling. No detail was overlooked. 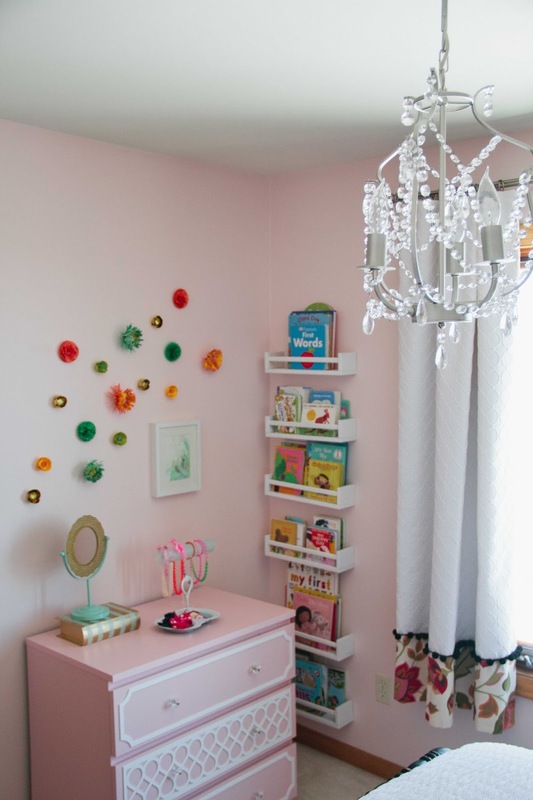 This will totally be my inspiration when I re-do my daughter's room. Thanks Amanda! What an honor! Thank you so much for stopping by, and for your sweet comments! Stephanie this is fabulous! Is your daughter the happiest little girl in the world right now? I love all your little touches and that ceiling of course! 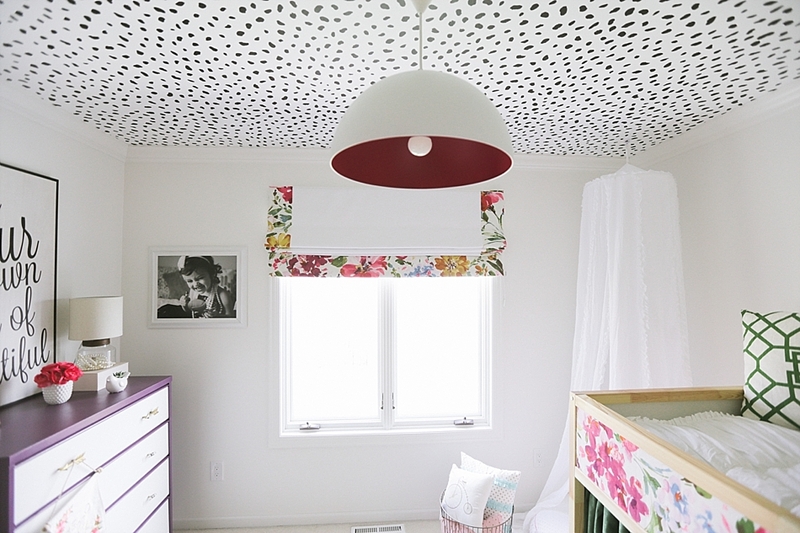 Love the pink inside the light fixture against the ceiling! You totally nailed this room! Congrats! She is the happiest girl around! Thanks so much for stopping by Tricia! How adorable is this room! 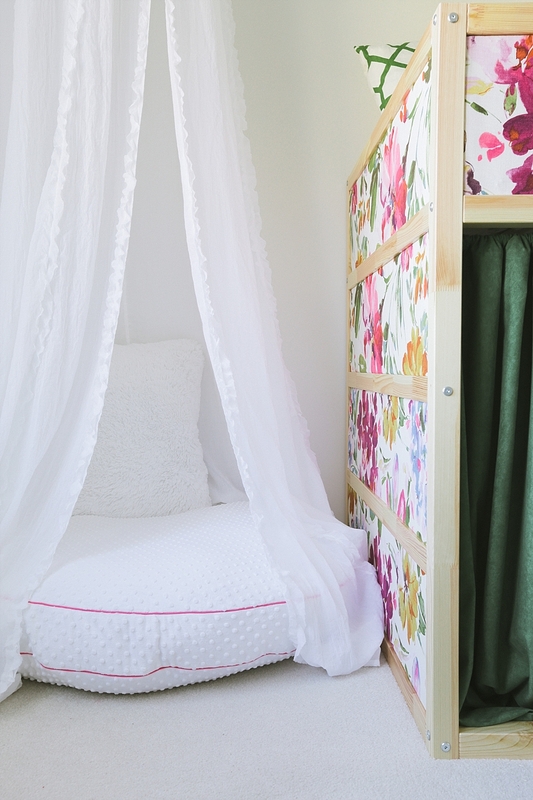 I love the cheerful palette and the small nooks and corners that a little girl will love to curl up in. Great job! Wow this is insanely beautiful! 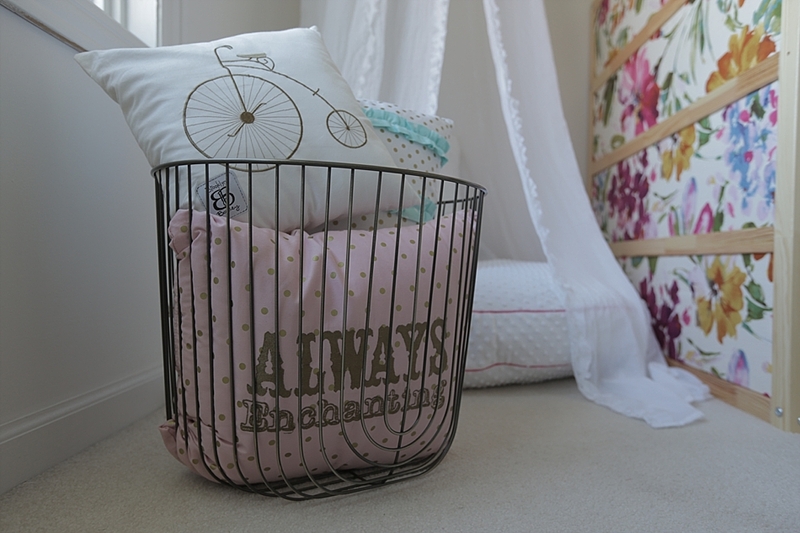 Your little girl must LOVE this room! That ceiling wow..I can only imagine how much time that took. Gorgeous space and so different! Beautiful!! I love what you did with the bed. Kids spaces are so much fun :-) I joined in on the ORC for the first time and worked on my boys' room- what fun, and such a good push to pull everything together! Oh Fun Ashlea! I would love to check out your boys room! Thanks for stopping by. Oh my goodness I love the room! 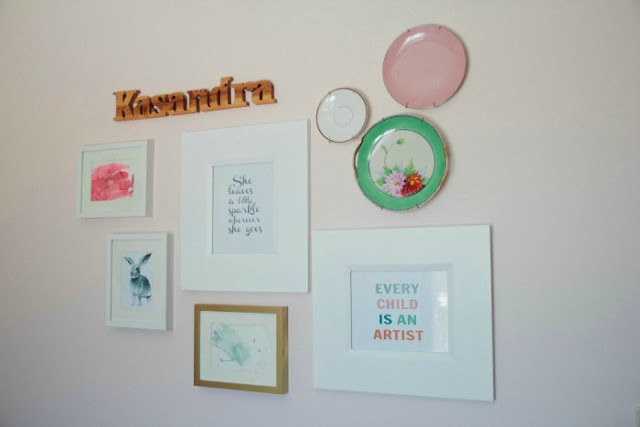 I did some similar things to my daughter's room too! I painted her ceiling a turquoise blue and the walls white! I don't think I would have been able to tackle a stencil, but that is a show stopper! All my daughter's furniture pieces are different colors as well. I noticed the tiny cuckoo clock you have and I just found one like that at a flea market! I didn't know they even made tiny ones. Mine is missing the weights and pendulum. Funny how it doesn't even have a cuckoo bird! Yes, I LOVE the mini "cuckoo clock" It was a gift from my Great Aunt, and she told me that it was a wind up clock, since it doesn't have a cuckoo bird. Who knew?! Thanks for stopping by, and for your sweet words! Stephanie, your daughter is one lucky girl! The room is fabulous!!! 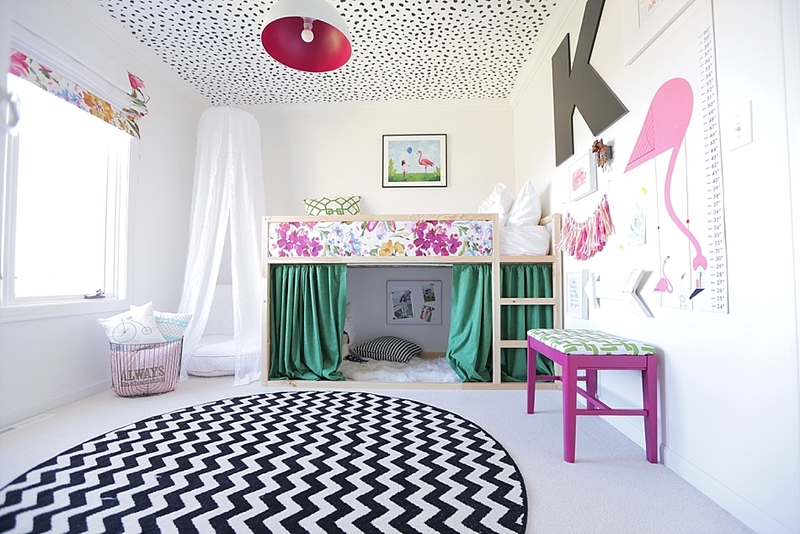 The white backdrop shows off the pops of color and pattern in the textiles and decor. 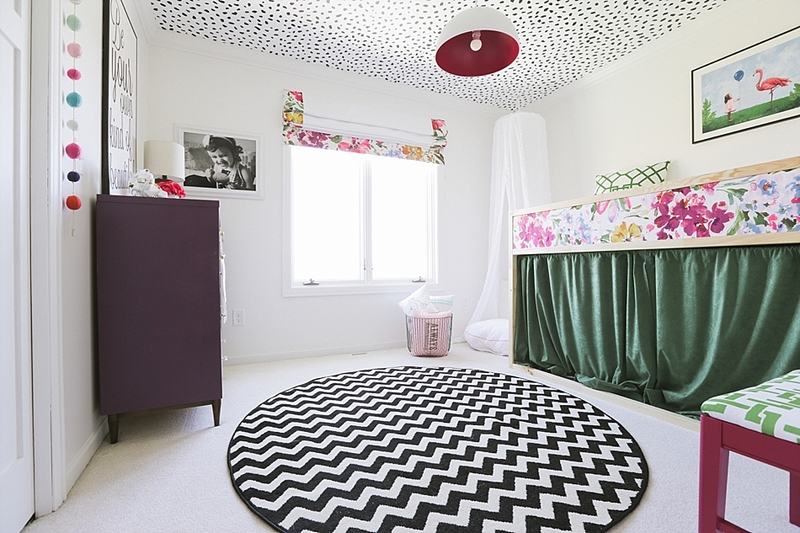 Love how you injected the black and white on the ceiling and rug! Congratulations and so well done!!! Thanks Carol! I hope you are enjoying your space you worked so hard on as well. I LOVE the way that turned out! FABULOUS! And your little lady is soooo adorable! 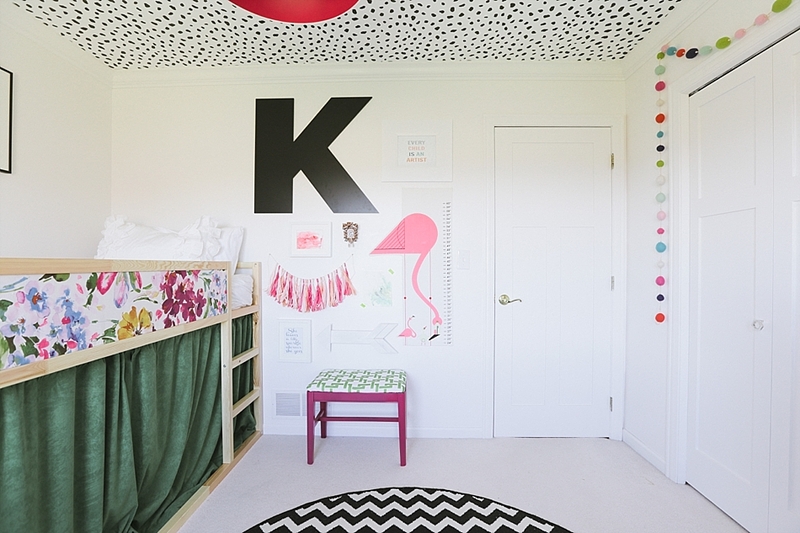 Love what you did with the bed and the ceiling, and all the wall art! Congrats and CHEERS to us for another room done! Thanks so much Vel! I appreciate you stopping by!!! Stunning and so cheerful and bright! So much stunning elements and can I just say I want a bed like that (is that weird?). Great work!! Thanks so much Lauren. Not weird at all! I kind of want to sleep in there too! haha! Thanks Erin! Right back atcha! This room is amazing! 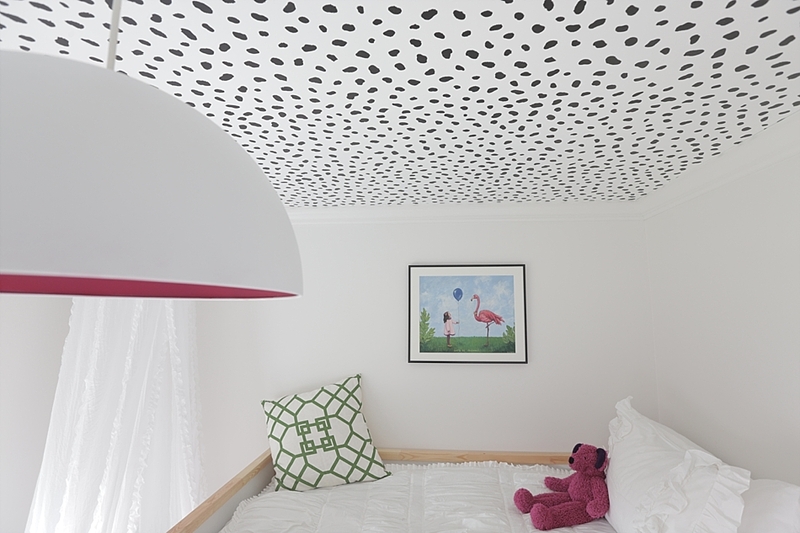 I LOVE the ceiling detail and the use of color. Fabulous!!!! Thank you! It was so fun to finish! This room is so cute! 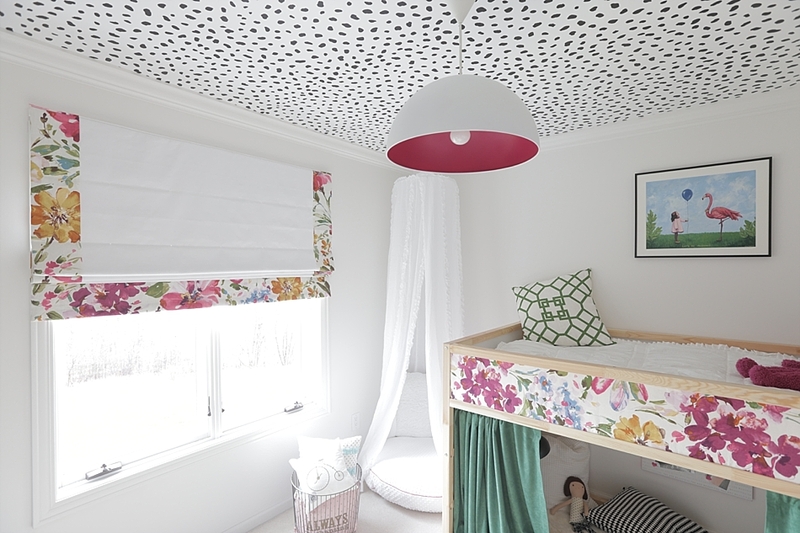 The ceiling is freakin' amazing, and I love love love the bed! Wow!!!! This is so impressive!!!! I'm in Love with all the color and that ceiling! It's perfect!! Simply superb! Thanks for the inspiration and excellent execution! Thank you!!! Glad you feel inspired! I LOVE every single thing about this space! So fun and whimsical yet classy and chic! Bravo! I love this space, gorgeous work! 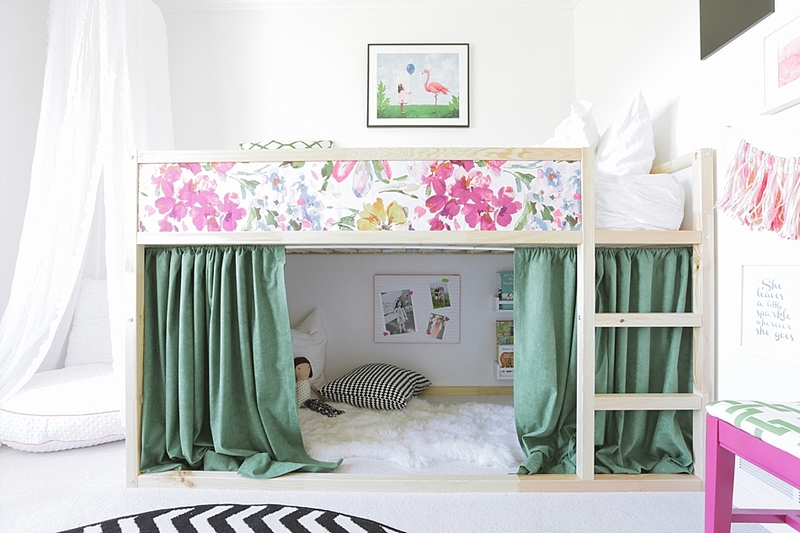 Is it weird for a near 30 year-old to want that bunk bed + reading nook? What a dream! What an amazing makeover! i am thrilled! 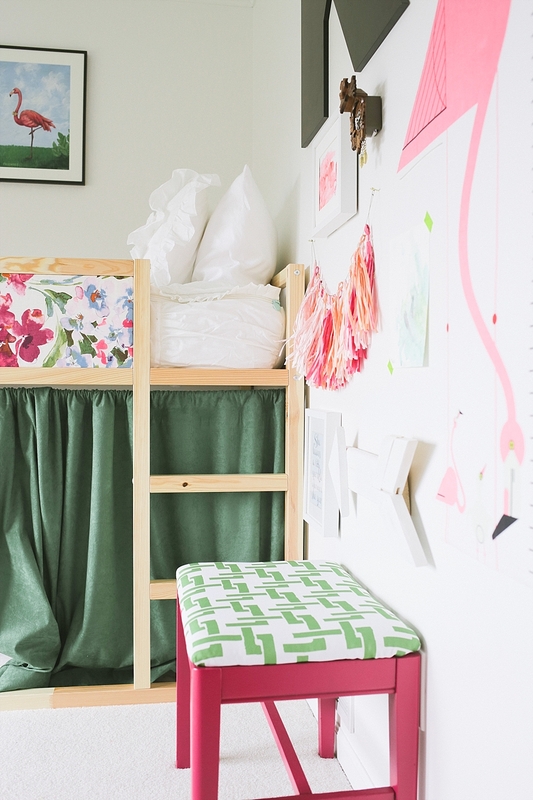 How many yards of fabric did you need to cover the bed panels? It is one of the most beautiful bedrooms i have ever seen!!!! Congratulations for the inspiration!!! I would like also to ask how many yards of fabric did you need to cover the bed panels and how have you have you done it??? Thank you in advance for the help and all these ideas! Holy Cow! What an amazing room!! 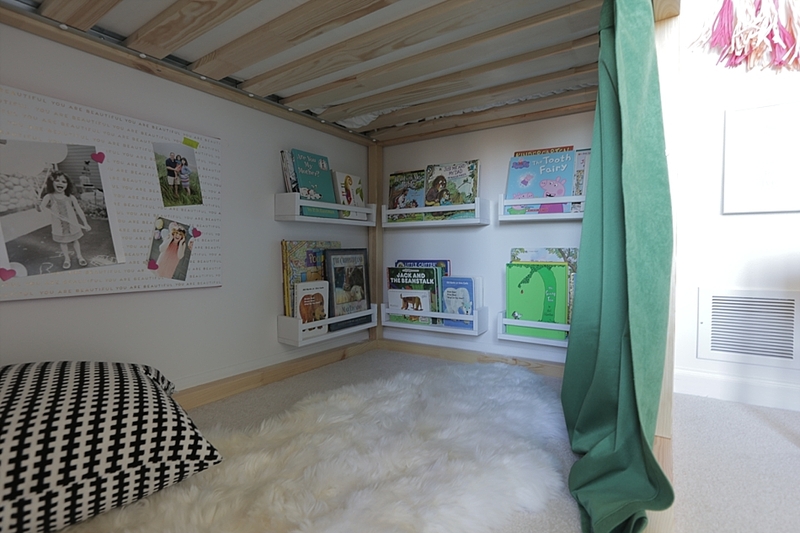 Love the under the bed reading space! You have made my inner little girl soooo happy with this room. TWO reading nooks. WITH CURTAINS. A fancy ceiling. Encouraging signs. Colors. Light. Different levels to be in, to hide, to be visible. It's lovely, just lovely. Thank you for posting this. Hi, what did u use to hang the curtain? Also how did u put the fabric on? Did u use any padding? I have rented apartment but my landlord and agency are very strictly so no repainted, hanging anything. large sheepskin rug, on question about it How many yards of fabric did you need to cover the bed panels? Are you looking to buy kilts online? Then don't waste any other minute and go checkout our website kiltzone.com now!